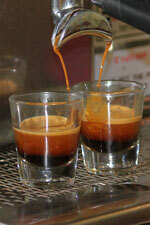 EspressOasis® partnered with Orinoco Roasters in 2011. Orinoco is a family owned company providing specialty coffees and teas for select gourmet retailers. With four generations of experience in the coffee business as growers, exporters, importers, and roasters, Orinoco consistently provides an excellent product. Our team of experts help provide varieties and blends of coffees, teas, coffee equipment, packaging options and other related products and services. EspressOasis® has developed proprietary blends and flavors with Orinoco and we continually work together to ensure that our cafes have the finest coffees available as well as some unique blends and origins you won't find at your everyday coffee bar! Our expert buyers around the world carefully select each of the green coffees available. We offers 15 Single Origins, in addition to 8 Organic Origins and 5 Decaf Origins. Green coffee purchases start by first seeking various samples and prices of offerings from trusted suppliers. Initial cupping, or taste testing begins at this stage. We evaluate samples and select the coffees that best fit quality parameters for blending. When the coffees reach the plant, samples are drawn from about 30-40% of the bags to ensure uniformity of the beans and to ensure that the coffee is the same as the coffee purchased at tastings. We then cup the coffees against the original purchased samples again to ensure conformity. A slow patented roasting process is used to achieve a full range of roasts and distinctive flavors. This process allows for the development of over 750 unique characteristics and flavors. Time-tested control methods create consistency for every roast; from the lighter roast of a house blend to the caramel of an espresso, to the dark pungent French Roast. The Roast Master cups each day's roasting production at the plantup to about 10-15 different coffees every day. We custom blend and roast the coffees as orders come through, and ship within a few hours to guarantee freshness. No inventory is kept on shelves beyond what is expected to ship in any given week. Coffees are packed in one way valve bags. This ensures that roasted coffees expel CO2 for 2-3 days after roasting. The one-way valves seal the bags and allow the CO2 to escape the bags without letting in any oxygen, coffee's number-one enemy.